Since I wrote the posts in the Future of Drought series, Aiguo Dai has come out with another paper on the subject. Mostly it's fairly incremental on the existing literature but I wanted to highlight a few interesting points (as I continue to think that this issue is the most important implication of present climate change science). You may recall - and if not you may reread - that the Palmer Drought Severity Index is a 1960s era index constructed to try to use simple weather data - mainly temperature and precipitation - to decide if there is a drought or not. This is more complex than it might appear at first thought since - for example - a given precipitation deficit means something completely different in the winter (when temperatures are low and there is little evaporation) than in the summer. And a given deficit in precipitation minus evaporation will mean something completely different if the soil starts out saturated than if it is already dried out. The PDSI makes use of a simple two-bucket model of how much water is in the soil and how it changes in response to temperature and moisture and then uses various normalization procedures to compare the resulting estimated soil moisture to what is normal for that particular climate. The final result is a scale which in principle runs from -10 to 10, but in which below -4 is a very severe drought and above +4 is an extremely wet period. This index has been in use for decades in the US, long before global warming was on the radar of all but a tiny handful of scientists. However, it's quite possible to take the values for temperature and precipitation out of global climate model runs and put them into the PDSI formula, and when that is done, the unpleasant prediction is one of widespread, rapidly-worsening-to-catastrophic levels of drought in the twenty-first century. The new paper adds to the existing literature in several ways. Firstly, there is a more systematic and widespread comparison of several modern tweaks to the original Palmer PDSI. The net-net of those is that the important conclusions about drought under global warming are qualitatively robust to the exact PDSI version used. Click for a large version. 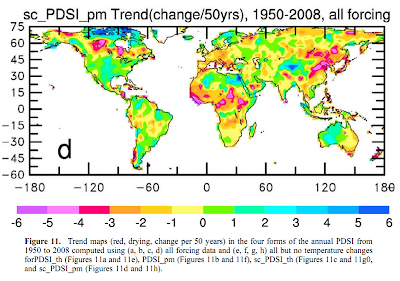 You can see that the PDSI does a good job in the temperate farm zones of the world (US midwest and Europe), a good job in South America, a bit less good in Siberia (where melting permafrost and lots of snow probably mess it up) and is weakest in arid areas of the world. Dai suggests that the latter is likely due to large-scale human interference in stream flow in arid areas (something the PDSI obviously does not model). The correlation is low (below 0.4) and insignificant over northern Africa, northern India, parts of the Middle East, central and northern Asia, and a few other areas. Since this is a correlation at the local grid box level, we expect some areas to have lower correlations because of poor sampling of precipitation and other forcing data used for computing the PDSI. 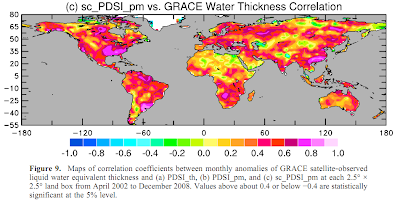 Also, continuing human withdrawal of groundwater for domestic, agricultural, and other usages in arid regions such as central North China, northern India, and the Middle East likely have affected the GRACE measurements, while it has little effect on the climate‐derived PDSI values. Tests showed that the correlation becomes positive over northern India when the GRACE data were detrended. This suggests that the GRACE data contain human‐induced variations and changes that are not considered in the climate‐driven PDSI values. Thus, low correlations should be expected over arid and other regions where such human influences are significant. 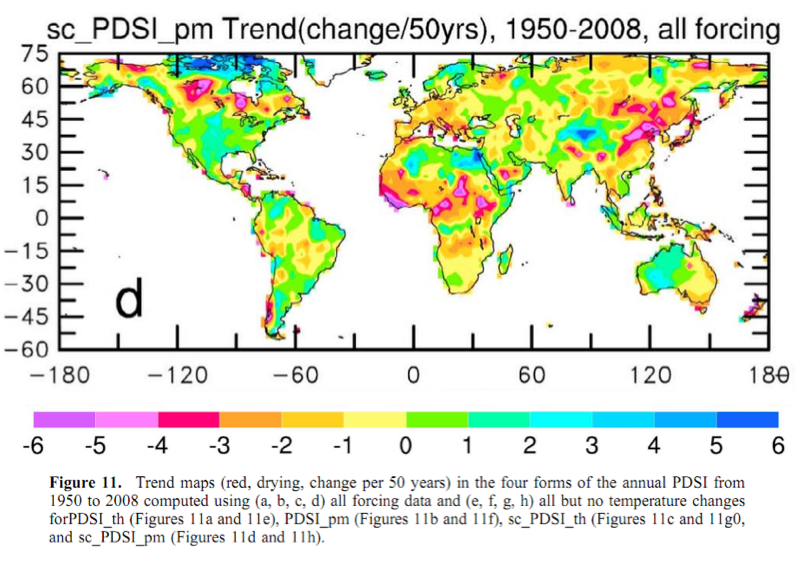 I conclude that the different forms of the PDSI can all capture many of the observed variations and changes in soil moisture and streamflow during the latter half of the 20th century around the world including many cold regions, and neither the use of Penman‐Monteith PE nor the self‐calibration proposed by Wells et al. significantly improves the PDSI’s ability to capture the observed soil moisture and streamflow variations. Furthermore, the different forms of the PDSIs are similarly correlated with satellite‐observed variations in terrestrial water storage during recent years. Indeed, there is some evidence that global trends of increase in net primary productivity (carbon capture by plants) has been slowing and perhaps even starting to shrink as a result of increasing drought - raising the fear of a new and more serious amplifying feedback in the global climate system. However, I remain puzzled by the lack of paleo-climatological support for this line of thinking. For example, Columbia and Venezuela do not seem to have lost tropical forest cover during the Paleocene–Eocene Thermal Maximum. Of course, the speed and nature of the current human impact on climate seems to be unprecedented in the geological record, so possibly things will work differently than in prior natural warming episodes. But I'd be more comfortable if I understood exactly why that difference was occurring. Query on " global carbon capture by the biosphere" -- do you mean " global carbon capture by the land-based biosphere"? I would have thought life in the oceans played a larger part by volume? Risa - yes I was referring to the land exchange. Exchange with the oceans is the same order of magnitude as the land but a bit larger IIRC. I always thought one of the most robust outcomes from the climate change models was a drying of southwest USA, much as we have seen over recent years, but the historical chart appears to be going in the opposite direction?